I did not set out to become a hard-core gym goer. I had no plan to be one of those people whose schedule is dictated by how early I have to be at the gym the next morning. I did not intend to memorize the protein content of most common foods (and some uncommon foods). And yet, that’s who I am. Or was, before the accident. But if it hadn’t been for the accident, I might not have realized that aside from being all of those things, I had simply become someone who loves working out. I was in a car accident about 4 weeks ago, and I haven’t been able to go to the gym since. Actually, forget even going to the gym, I haven’t been able to so much as go for a brisk walk. For the first week or so I was in enough pain, and was feeling protective enough of my body that I didn’t even think about the gym. Not being able to work out after my car accident was a little like adding insult to injury. 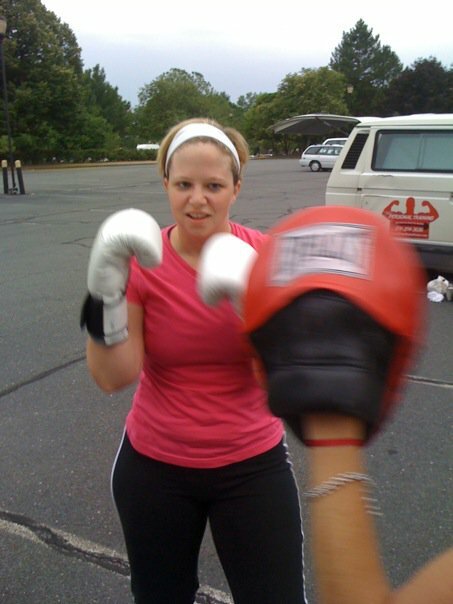 Working out, specifically boxing which I’d recently started doing, was my primary source of stress relief. After the accident I was so pissed off at the other driver for being careless and screwing up my life, that my need to punch something was stronger than it had ever been before, and yet I couldn’t even slap someone hard enough to sting. I tried to look on the bright side: I could sleep in. I didn’t have to pay as much attention to how much protein I ate in a day. I had a good excuse for comfort eating AND didn’t have to then look my trainer in the eye next morning. And that worked for a little while. But slowly I started to notice I was short-tempered, unmotivated and more prone to cry than usual. I wanted to do less and less even as my body healed more and more. I started trying to move as little as possible, test the limits of my healing body less and less. . I wanted to sleep more and more. At my physical therapy appointments everyone was very impressed at how quickly my body was healing, and yet I just felt more and more frustrated and irrationally irritated with the doctors for not saying I was back to normal. And then I started to notice my hard abs, of which I’d been so proud just weeks ago, were getting covered up by a soft layer of flab. I tried to go back to the careful diet of the days before I burned a thousand calories per workout to combat my softening middle. But I cheated and made excuses more often than not. And then one day as I snoozed my alarm two times too many, I suddenly wondered where that strong woman with all the willpower had gone. Turns out, I’d left her in the gym. Strength begets strength. And weakness begets weakness. In the gym, every time I think I’m at my limit my trainer makes me go one step further, throw one more punch, add one more unit of weight. And I not only do it, I usually end up doing a little bit more. Because its intoxicating to realize that you are strong, that you are capable. At some point in almost every single workout I surprise myself – either by doing more than I thought I could, or by realizing how much progress I’d made since starting, and I’d swell with pride, and strength and a feeling of accomplishment that I’ve rarely been able to find with such consistency any other way, and it permeated my whole life. Making healthy choices in my life, either in terms of diet, lifestyle, or emotional health became easy, because I was strong. It wasn’t hard to say no to late night food or drink offers, because I didn’t want to be tired for my workout. It wasn’t hard to say no to the tempting but destructive relationship because I knew I was better than that and strong enough to make the tough choices. Will power and discipline weren’t an effort, they were a fact, because I was in fact, a strong and disciplined person. Plus, I had more energy than I knew what to do with, was usually in a good mood, and felt great about how I looked which only made my mood and confidence stronger, and my commitment to maintain all of it stronger by extension. It was a positive feedback loop. But now, after four weeks out of the gym, I’m lost. I miss the structure and the routine of my workouts and being accountable to my trainer. But more than anything, I miss the constant reminders of my strength. That car accident scared the hell out of me, and it hurt my body in ways I haven’t experienced before. It reminded me that there is very little I can control in my world. I was on my way to a pool party, and then I was standing in the middle of the road, crying uncontrollably, looking at what used to be my lovely little car, horribly aware of how much worse it could easily have been. I’ve bought a new car, I’ve hired a lawyer, and I’ve followed doctor’s orders to the letter, and by most external measures I’m almost back to normal. Except I don’t feel back to normal. I feel too small and delicate for this world. I feel unable to control my life. And I definitely don’t feel strong, or powerful, or capable. I’m stuck in a negative feedback loop. And the longer I’m away from the gym, the harder its going to be to break it. When I think about working out I’m scared of getting hurt again, I’m scared of what will happen if I stop focusing on protecting my body and start pushing it to its limits again. I’m scared that I’ll find out I’m too broken to get back to that person I was before. But I believe everything happens for a reason, and I believe this accident happened, in part, to help me own the fact that I’m one of those people who loves working out. So I’m not going to fight it anymore. I’m not going to apologize for finding conversations about protein and calorie content fascinating. I’m going to obnoxiously show everyone my developing muscles, and I will continue to act like I’m humbly accepting people’s compliments while gloating on the inside. I just need to remember all of that and not hit snooze when my alarm goes off at 4:45am. Which is maybe the greatest act of will power I’ve ever exhibited in all my months of working out.